• 1.000Watt, 1.500Watt 2.000Watt, 3.000Watt, and 5.000Watt output power in continuous service: all parts used in these amplifiers are oversized to guarantee the full power 24/24 h even in hard environmental conditions. • Z-Matcher System for all 87.5 - 108 MHz. Improved with Z-Matcher Technology for best amplifier efficiencies, minimizes phase error and increasing system reliability. 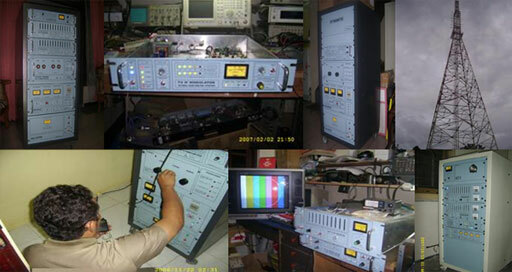 The frequency of these amplifiers can be easily field tuned from 87.5 MHz to 108 MHz without any parts modification. • High Quality Power Mosfets. With Cold FET Technology, The amplifier uses strong and reliable LDMOS Mosfet, widely used in the broadcast field, that assure long life and low maintenance costs. • Adjustable output power. allows the adjustment of output power simply varying the input one and/or by LCD Menu Sub System. • Frequency agile. Instant direct frequency programability from LCD Sub Menu with 10KHz steps. No tuning or adjustments required. • Digital stereo coder. High performances digital STEREO CODER BUILT-IN (optional) with stereo separation (≥ 65dB) and signal/noise ratio (≥ 80 dB) for a top sound quality. • Top quality sound. The generated signal is characterized by an excellent signal/noise ratio and by negligible residual AM and FM. All this guarantees the best quality of the broadcast signal. •High frequency stability in short and long terms is assured by uProcessor Controlled Digital Phase Locked Loop circuit with low drift quartz reference. • Deviation limiter. Internal dynamic function limits the maximum frequency deviation according with the international requirements (CCIR, FCC, etc…). This is to avoid adjacent channels invasion in case of accidental overmodulation without reducing the modulation quality. • LCD Menu Metering/Indicators: Working Frequency, Forward Power, Reflected Power, Frequency Deviation, Internal Power Supply Voltage and Current, Heat Sink Temperature, Input Audio L & R levels are displayed by front panel LCD Display. • uProcessor Controlled protections assures an affordable and stable operation protecting units against major fault conditions. Every alarm event is displayed by front panel LEDs and/or LCD Menu and can be reseted by manual control and/or automatic reset control. • Full metering. All the main parameters of the amplifiers are front panel LCD displayed by a complete measurement system. • Soft-start circuit control: the gradual insertion of power supply eliminate transient problems during start-up. • Forced air cooling. An oversized cooling system guarantees regular functioning and long life for the cavity/tube set even in hard environmental places. • Meets or exceeds international standards for safety and electrical specifications. - Input level : -10÷+12 dBm adj. - Input connectors : XLR female/bal. - Input connector : BNC, unbal. - Input connectors : (L&R) XLR,bal. - SWR, Current Overload, Over Voltage, Cooling Failure, Power Limit (others on request). •	Humidity	: 95% max.